Depression glass brought a little cheer into the dreary times of the late 1920s through the early 1940s. Mass-produced by manufacturers such as Federal Glass, MacBeth-Evans, and Hocking Glass, this molded glassware came in beautiful colors and patterns to suit every taste. However, it was of relatively low quality, with pieces often exhibiting air bubbles, heavy mold marks, and other flaws in the glass. To those who look beyond the surface, Depression glass is more than just another collection. It provides an intriguing, interesting hobby rich with history, and it brightens the home along with the spirit just as it did back in the day. The most popular colors with collectors today are pink in varying hues (some are very light in color, while others have an orange tint to the pink), cobalt blue, and green. Depression glass was also made in amber, iridescent, opaque white known as Monax, and several other colors as well. Some of the most popular patterns buyers seek today are Cameo, Mayfair, American Sweetheart, Princess, and Royal Lace. Even the pattern names alluded to better times and a longing for the glamorous lifestyles of the 1920s. Saying times were tough during the Great Depression is nothing less than an understatement. Most Americans that didn’t lose their jobs were often forced to take pay cuts. Learning to live on little or nothing was the way of life for many families for the decade beginning in 1929. Today we recognize many items used in the home during the 1930s as collectibles, including Depression glass. 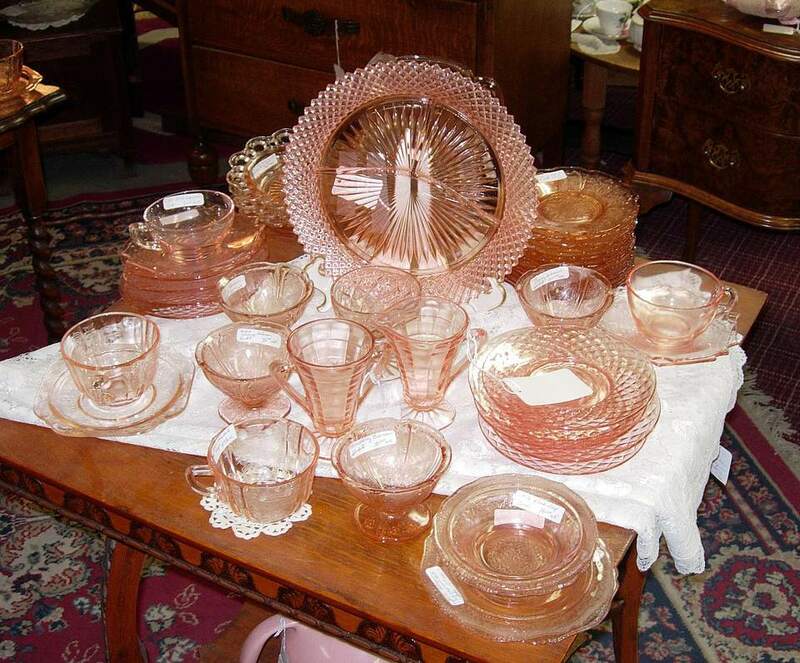 Depression glass was popular and affordable when it was new. The dime store, where the thrifty homemaker could find everything from toiletries to household goods, was a common source for this inexpensive purchase. At a time when a loaf of bread would set you back about a nickel, frugal shoppers could also buy a piece of Depression glass for around the same price. Depression glass also made its way into American homes through the issuance of premiums. Sellers or manufacturers would offer a free gift with the purchase of a certain dollar amount of goods or a specific product, and penny-pinching ladies took full advantage of these freebies. Glass was plucked from an oatmeal box one week, then from a detergent box the next. Sometimes gas stations would throw in a punch bowl and matching set of cups with an oil change. Movie theaters got in on the action offering a piece of glass with a ticket to a Saturday matinee. You might even hear old timers refer to some of these pieces as "oatmeal glass" due to their origin. Have I learned enough about Depression glass to know what I'm buying? Has the pattern I've chosen to collect been reproduced or reissued? Do I understand the issues relating to condition, which can diminish the value of Depression glass? Do I know how to examine glassware for damage? Building a reference library should go hand-in-hand with actually purchasing glassware. "The Collector’s Encyclopedia of Depression Glass" by Gene Florence went out of print with its 19th edition in 2009, but it serves as a good foundation, so hunting a copy down can pay off. While the price will be outdated, it has excellent information on the major patterns collectors want to study. Reproductions of Depression glass have waned in the recent past, so even though the book hasn't been published in several years, the reproduction section in the back of the book is still very useful. While reproductions concern and discourage some collectors, a little research goes a long way to protect your investment. For many years several Depression glass patterns like Cherry Blossom and Madrid were widely reissued, and a number of others have also been reproduced in decades past. Some patterns only had select pieces reproduced. It is possible to collect sets in the copied patterns without being stung by repros, but buyers should check all resources and buy from reputable dealers if choosing to collect a pattern known to have been reissued. An excellent resource for reproduction glass information online is JustGlass.com, and you can shop while you're there researching. Beyond repros, condition is probably the most troublesome aspect of the Depression glass hobby. Finding reasonably priced glassware is sometimes a challenge, but finding it in excellent to mint condition can seem impossible at times. Because these items were used on a daily basis in many homes, they are often found scratched, chipped, or cracked. To avoid purchasing flawed glass, look at each piece carefully to check for damage. Run your finger around all edges and rims to feel for chips. Hold each piece to the light to make cracks more visible, especially at the base of handles on pitchers, creamers, and cups. Always avoid items that are excessively scratched by knives and other utensils, especially if you anticipate wanting to sell them in the future. Cloudy glass permanently etched by automatic dishwashers, commonly referred to as “sick” glass, should be avoided as well. This damage should not be confused with water rings seen in old vases and other vessels as evidence of evaporation. Water rings can often be removed, but the luster can never be restored in a piece of sick glassware. When shopping online, be sure to ask the dealer to double check for damage before shipping and verify the return policy, just in case you need to use it. With novice sellers more so than experienced glassware dealers, be very specific about how to check the glass for damage and make sure they package it securely.